Summary: Scientists take a renewed interest in locating a piece of local lore. 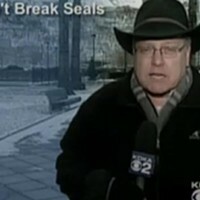 Reporter: Bob Allen, KDKA Channel 2. 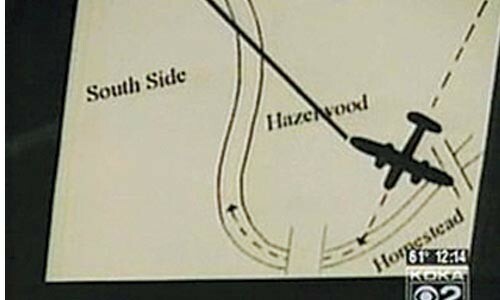 Airtime: 2 minutes, 46 seconds on Oct. 9 Visuals: * Illustrations and maps on display at the Heinz History Center depicting the enigmatic incident. Highlights: * When Allen begins with background info: "Well, it's part of a history lesson that I can remember from elementary school. A World War II airplane crashed in the Monongahela River near Homestead. Well, years later, efforts are now underway to solve that mystery." * When Allen muses: "What happened to a World War II-vintage B-25 bomber that crashed ... back on January 31, 1956?" * When he adds "Of the six crew members, four survived and two drowned. The plane sank immediately into the river. For two weeks, Coast Guard rescuers searched the river and then gave up. Today, members of the B-25 recovery team believe the plane, though corroded and broken up into pieces, is still buried somewhere in the mud of the river." * When John Uldrich, a member of the team, who looks kinda like Indiana Jones in his hat, explains, "The Monongahela being what it is, it's gotta lotta barge traffic on it. And barges hit it -- it wouldn't even be a speed bump to 10 100-foot barges in a row. They wouldn't even feel it. Grind it up, chop it up, push it further and further down." He adds, "We're gonna have subsurface profiling devices. We're going to have magnetometers. They're really high-performance. " * When Allen fills in, "The recovery team admits the plane isn't worth much, but it's an important piece of local history. Plus there was some intrigue connected to the plane when it left Nellis Air Force Base in Nevada." * When Andrew Masich of the Heinz History Center tells us, with a gleam in his eye: "That's where Area 51 is. Maybe there were aliens on board. Maybe there were Las Vegas showgirls. Some people speculated a Russian spy was on board, and that's the reason the government has tried to hush it up. But I don't think any of those theories are really true." * When Allen ends by saying the team is "confident of finding something related to the plane, and hopefully solving the 52-year-old mystery." What We Learned: It's high time we found out the plane truth. Unanswered Question: If they find the bomber -- can they start looking for the glowing green man of South Park, so I can have some closure? News Value: 5. Allen does good work with the time he has, offering history and several interviews with interesting folks.